From time to time, our trusted partners share great recipes that we like to pass along to our readers. 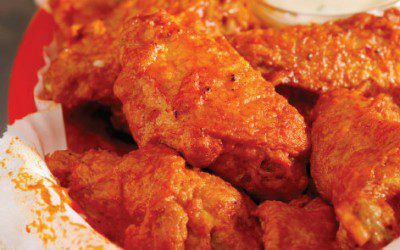 Below, you’ll find a delicious Grilled Buffalo Chicken Tenders recipe from our associates at Walden Farms. Bon appétit! Cut chicken into “tender” size pieces. Marinate chicken in Walden Farms Calorie Free Thick ‘N Spicy BBQ sauce for at least 30 minutes. Prepare grill for direct grilling. Brush off excess BBQ Sauce, then place chicken on grill. Stir dash hot sauce, if using, into remaining Walden Farms Calorie Free Thick ‘N Spicy BBQ Sauce and baste chicken as it grills. Grill chicken until cooked through and juices run clear. Serve with Walden Farms Calorie Free Bleu Cheese Salad Dressing for dipping. Recipe and nutritional information provided by Walden Farms.